Hamnavoe is a lovely tranquil fishing village . 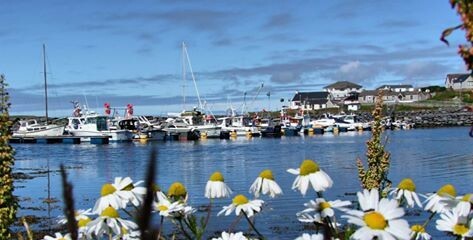 Nestling in a sheltered voe looking out over the Atlantic Ocean to the island of Foula, it provides many beautiful walks and is only 10 minutes drive from Scalloway and 15 minutes from Lerwick. Spectacular in autumn and winter with the huge waves rolling over the Hurds and Lighthouse. Spectacular sunsets in the spring and summer. Visit in any season for a memorable stay. Weisdale a small village on the westside at the head of a long voe on the westside is a special place. Home to the largest plantation of trees in Shetland, with burns and bridges, the beautiful planting (done by the BBC TV Beechgrove Garden team) at the Weisdale Kirk, it glows with colour. Fishing in the nearby loch and in the voe is possible. One of the most spectacular views in Shetland can be had from the Scord of Weisdale. Come and see for yourself.